Former VRA Chief executive Dr Charles Wereko-Brobby has described the creation of the Power Ministry as “futile” and encouraged the President to scrap it, one year after it was created. In an uncomplimentary verdict, the energy expert says the action by the President has “clearly” not yielded justifiable results. The Power Ministry and Ghana Gas clashed yesterday in a blame-game over who was responsible for an escalation in the power crisis. The Power Ministry said Ghana Gas company which is under the Petroleum Ministry had shut down to cut supply of gas to the Aboadze in order to connect its plants to a new power barge from Dubai – AMERI. This, the Ministry said has created a temporary fuel shortfall to power the plants. But the Ghana Gas Company responded that the shutdown was done on the instruction of the Volta River Authority, an agency under the Power Ministry. Ghana Gas suggested the Power Ministry was claiming innocence and shifting blame. The media tussle has given life to the perception of a turf war between the Power and Petroleum ministries. The Power sector of the Petroleum Ministry was yanked out of the control of the Petroleum Minister Emmanuel Kofi-Buah on 22 November 2014 – a time when power crisis was biting very hard. 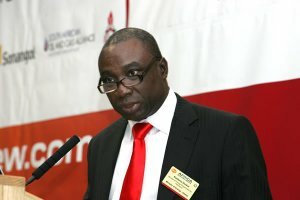 It was packaged into a new ministry and given to the Pru East MP Kwabena Donkor who promised to end loadshedding within a year or in default, resign. Energy Ministry is currently limited to handling Ghana’s fuel requirements while Power Ministry deals with increasing megawatt capacity and power generation. The two ministries are in the same building in Accra. A year after the creation of the Ministry, the power crisis has experienced an intensity. Wereko-Brobby had urged that Ghanaians gave the President the benefit of the doubt when the Ministry was created last year. But he believes a year is enough to make conclusions about Power Ministry’s relevance and efficiency. He told Joy News its time president Mahama merges the two state agencies. “We should simply go back to one ministry with probably two deputies, one in charge of power, one in charge of petroleum”, he told Joy News’ Francis Abban of the Energy Desk. He said government should cut its losses and save the country some money because the Power Ministry is not working. He said the miscommunication which played out in the media yesterday is a “classic case” to support his position. Dr. Wereko-Brobby said all the plans by the Power Ministry to bring power barges from Dubai and Turkey to address the power crisis had already been started by the Energy Ministry. The Power Ministry is therefore doing nothing new since it was created. The Minister should be sacked or should resign if he fails to fufill his promise to end loadshedding by 31 December 2015, he said. “It is about time we developed the culture of taking responsibility to achieve what we promised. Nobody asked the Minister of Power to promise to end dumsor by the end of the year”, he told Joy News. But the Executive Director of the African Center for Energy Policy (ACEP) Dr Mohammed Amin Adams has disagreed. He believes the call is premature. He told Joy News the Ministry was not only created to solve the current power crisis but also to look for investment into the power sector. Although he backed the Power Minister as competent enough to turn things around, Amin Adams believes his promise to end the crisis by the end of the year was hasty. “He went too far in making promises he cannot deliver within one year” Amin said. He said Ghanaians should not expect “magic” solutions to the recurring challenges in the power sector. The energy expert wants Kwabena Donkor to be more cautious in his approach to problem-solving.